Vermont Day-Cations: 10 Trips to Explore Vermont's Mountains & Trails | Features | Kids VT - small people, big ideas! Caleb Kenna Rebecca and Steve Crittenden stop on the trail to Snake Mountain to make some adjustments for Wyatt. Summer in Vermont is short and oh so sweet. To help you get the most out of this fleeting season, Kids VT presents a three-part series of recommended summer day trips designed to introduce your family to the rich variety of experiences Vermont has to offer. The June issue of Kids VT featured cultural and historical trips, the July issue focuses on mountains and trails, and the August issue will offer ways to get out on the water. You can find them all as they appear each month on kidsvt.com. Each recommendation includes other nearby attractions, as well as an affordable place to get or eat food. For more meal tips, pick up the 2011 edition of 7 Nights: The Seven Days Guide to Vermont Restaurants & Bars, available at more than 1000 locations statewide, or find it at sevennightsvt.com. These lists are not comprehensive, but we hope they'll inspire you to travel to a part of Vermont you've never seen before, to get off the highway and try something new. On a gorgeous summer day, the drive along scenic country roads is part of the fun. Was American naturalist John Muir thinking about pint-size hikers when he observed, "In every walk with nature one receives far more than he seeks"? 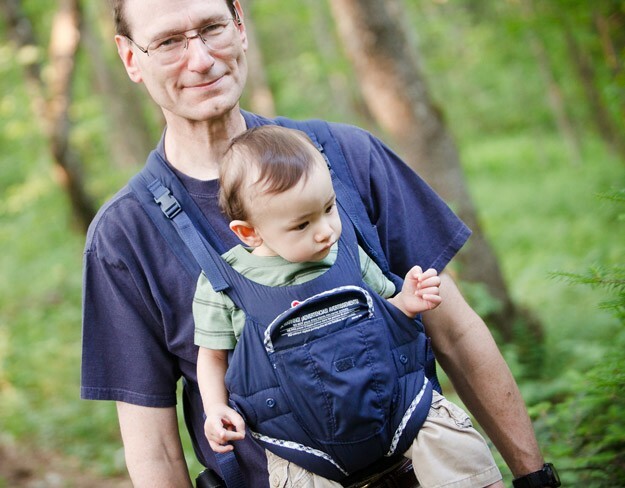 Outdoor adventure is recommended for people of all ages. But children, in particular, are shaped by their encounters with the natural world. There are so many good reasons to get kids into the woods, not the least of which is that a strong relationship with nature — established early — is the best guarantee of future interest in protecting the environment. Soldiering up the steep slope of a mountain is a great aerobic workout and an exercise in goal setting. Luckily, these opportunities are quite literally all around us in Vermont. And they're mostly free. The following 10 day-cations will help you and your family enjoy the state's mountains and trails. These trips will get you climbing Snake Mountain, scrambling up a rock face in Bolton or zipping through the trees on a canopy tour at Smugglers' Notch. Rebecca Crittenden enters the Snake Mountain Wildlife Management Area with her husband, son and dogs. Someone once found a whale skeleton from Lake Champlain's prehistoric salt-water past on its slopes; a mountain-top inn on the site welcomed 19th-century tourists; at the summit, the foundation of a house never built serves as a flat picnic and photo ledge — not to mention a good storytelling spot. But the best reason to visit this 1287-foot mountain is that it's a slam-dunk destination for easy-to-reach panoramic western views of quilted fields and Lake Champlain. The hotelier who built the inn called the mountain "Grand View," and he was right on. Kids ages 6 and up should be able to handle the 1.8-mile ramble along old carriage roads to the top. Details: From the junction of Routes 17 and 22A in Addison, go south on 22A for 3 miles and take a left on Wilmarth Road. Follow it to Mountain Road and take a left. The trailhead is about 500 feet from the intersection, on the left. 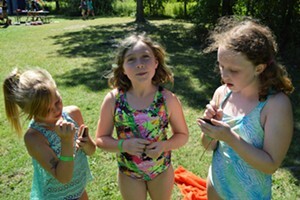 Nearby: Cool off in the swimming pool — on the waterslide or in the fountains — at Button Bay State Park in Vergennes. The park also has 73 camping sites, including lean-tos and cabins. Info, 475-2377, vtstateparks.com. Food: 3 Squares Café, Vergennes: Order breakfast until 3 p.m. at this popular downtown eatery, or go for "creative-casual" lunch and dinner fare; there's a kids menu, too. Info, 877-2772, 3squarescafe.com. Rock climbing is a great equalizer: Your kids can probably climb more ably than you. "Kids have awesome strength-to-weight ratio," explains Steve Charest, program director for Burlington's Petra Cliffs. The climbing center and mountaineering school helps you and your kids enjoy this outdoor activity together during Family Climbing Days at Lower West Bolton, a prized Chittenden County crag. On July 16 and August 20, you and your offspring (ages 6 and up) can meet up with instructors in Bolton for a short hike to the cliff. A brief course in safety and basics gives way to a day of climbing and rappelling way beyond the swing set. Miles: N/A — the approach is less than a two-minute walk. Details: The crag is located on the right-hand side of the access road to Bolton Valley Resort. Family Climbing Days cost $160 for parent and child, $50 for each extra child and $60 for each extra adult. Info, 657-3872, petracliffs.com. Nearby: Take a dip in the Bolton Potholes, a series of natural swimming holes formed by Joiner Brook — find it on the access road to Bolton Valley Resort, but park in the elementary school parking lot below. Nearby: Little River State Park in Waterbury has 81 tent and trailer sites and 20 lean-tos on the shores of Waterbury Reservoir. Info, 244-7103, vtstateparks.com. Food: On the Rise Bakery, Richmond: Pick up baked treats and vegetarian sandwiches — including backpack-friendly PB&Js — starting at 7 a.m.; return later for live music and pizza. Info, 434-7787, ontherisebakery.net. Geronimo! This new adventure at Smugglers' Notch sends families flying along a set of eight zip lines suspended high above the forest floor. The tour is part adrenaline-infused action, part education and all safe, as harnesses and experienced guides are with you every whoa! of the way. It opened last winter, but this canopy tour — with 4500 feet of zip lines and two suspension bridges — is particularly thrilling in the summer, when the bright-green foliage seems to swallow up riders and platforms alike. Just one hitch: Kids have to be at least 70 pounds to ride. Miles: N/A — a shuttle transports riders to and from the starting point. Details: $99.95 for the three-hour tour, reservations required. Info, 644-9300, arbortrek.com. Nearby: Smugglers' Notch has eight heated outdoor pools, four waterslides and a slew of other splash-friendly features at its water park. Info, 800-419-4615; smuggs.com. Nearby: Fall asleep to the sound of Bingham Falls at Smugglers' Notch State Park in Stowe, which has a small campground. Info, 253-4014, vtstate parks.com. Food: Cupboard Deli, Jeffersonville: Fuel up with homemade doughnuts or creemees and other to-go goodies at this Citgo station and deli. Info, 644-2069. Yeah, yeah, more ice is the last thing you want to see after such a long winter. But this place is really, ahem, cool, especially on a hot July day when the rest of Vermont is baking into a soufflé. Not far from Route 7, this easy amble begins at a picnic area and then darts through the woods toward ooh-ahh views of White Rocks Cliff. Then come the goose bumps, from gaping into crevices that preserve snow and ice even in the sweltering summer, offering an instant cold breeze. Note: This hike is preschooler-friendly, but you'll want to hang on to their collars at some of the precipitous points. Details: At the junction of Routes 7 and 140 in Wallingford, go east 2.1 miles on Route 140 to Sugar Hill Road, the Green Mountain National Forest Picnic Area and the trailhead. Nearby: Let the kids wade in Wallingford's Elfin Lake, which has lifeguards from noon to 5 p.m. $3 entrance fee for adults; $1.50 for ages 2 to 18; children under 2 free. Info, 446-2496, wallingfordvt.com/elfin_lake.htm. Nearby: Twenty minutes south of Wallingford, the aptly named Emerald Lake State Park in East Dorset has 67 campsites and 37 lean-tos in the former quarry area. Info, 362-1655, vtstateparks.com. Food: Sal's South, Wallingford: Find pizza and other Italian classics at this family-friendly eatery. Info, 446-2935. Mary Jane and Paul Oszurek trek along the Long Trail with 10-month-old Ethan in a front-pack and 2-year-old Sophia leading the way. This spot is no secret — there's even a Long Island rock band called Falls of Lana — but there's a reason why everyone knows about it: in a word, waterfalls. There are a few different trails spidering around the four tiers of tumbling water at the Falls of Lana; you'll hike less than a half-mile on the easiest trail to the lower-falls viewpoint. From there, it's another half-mile to the upper falls and the turquoise swimming hole. Note: Footing can be tricky. In August, families can continue on to Rattlesnake Point, closed March 15 to August 1 for peregrine falcon nesting. If the falls seem too freaky for a swim, head to adjacent Lake Dunmore for a dip. Details: At the junction of Routes 7 and 53 in Salisbury, take a left on Route 53 and go 3.5 miles to Branbury State Park. The trailhead is near the park. Nearby: Camp and swim on Lake Dunmore; the private Waterhouses campground has 71 sites. Info, 352-4433, waterhouses.com. Food: A&W Drive-In, Middlebury: Carhops on roller skates deliver rootbeer floats, cheeseburgers and onion rings. Info, 388-2876. 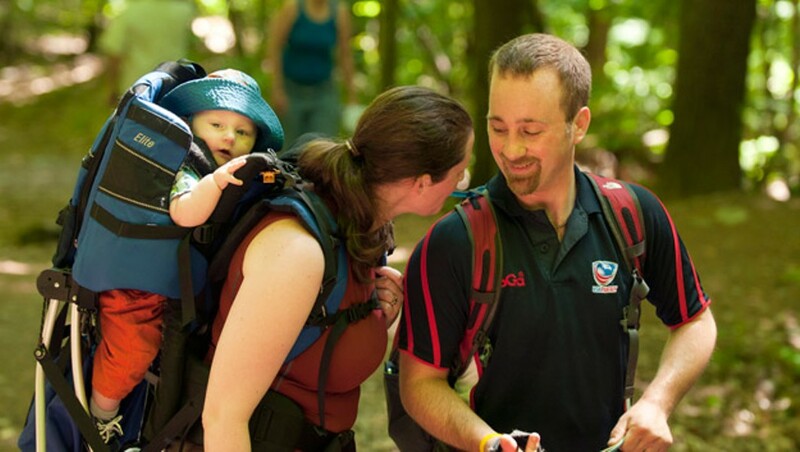 One day, you'll hike the whole 270-mile Long Trail as a family. Right? For now, however, this small section of the storied footpath — the country's first long-distance hiking trail — is enough for little feet. Plus, it's got spooky rock tunnels and caves, bridges, and boulders. The strategy, other than following the white Long Trail blazes, involves pacing. That's because the trail descends to begin with and ascends on the way back out, just when legs and patience are giving out. So plan to refuel with your trail mix and water at Spruce Ledge Camp, just past the delights of Devil's Gulch. This close to the Canadian border, you may actually feel as if you've come all the way from Massachusetts. Details: At exit 26 on I-91 North, take a left on Route 58 West and follow for nearly 13 miles. Take a left on Route 100. Follow for 8.7 miles and take a right on Route 118. Drive 4.5 miles to the trailhead. Nearby: Try out the rope swing at the Green River Reservoir in Hyde Park, then spend the night at the eponymous state park, which has 28 remote campsites that can only be reached by boat. Info, 888-1349, vtstateparks.com. Food: Sweet Crunch Bakeshop & Catering Co., Hyde Park: Swing by for Sunday brunch; musicians play from 10:30 a.m. to 12:30 p.m. most of the summer. Info, 888-4887, sweetcrunch bakeshop.com. In 2008, trail workers made history when they opened the first universally accessible portion of the 2175-mile Appalachian Trail — right here in Vermont. Anyone who uses a wheelchair or stroller can hop on this 900-foot, smooth boardwalk over the Ottauquechee River floodplain for awesome views of the 140-foot falls. It's short, but for anyone who's tried to wrestle wheels over rocks and roots, very sweet. Details: From the intersection of Routes 100 and 4 in Killington, drive 2 miles east to River Road. Take a left and drive 1.5 miles to a parking lot, and the trailhead, on the left. Nearby: Sluice off the sweat at the Clarendon Gorge swimming hole, just off Route 7. 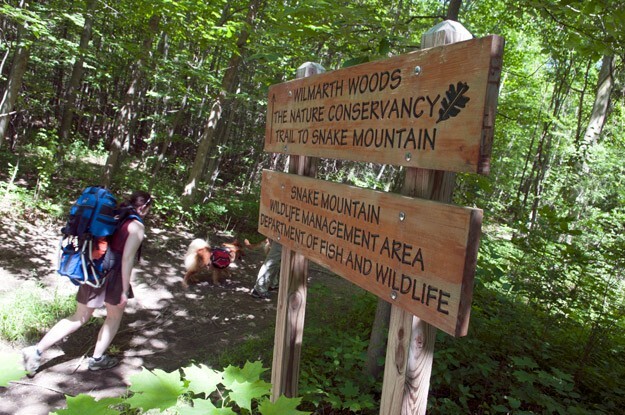 Nearby: Killington's Gifford Woods State Park has four cabins, 22 tent and trailer sites, and 20 lean-tos at the base of Killington and Pico peaks. Info, 775-5354, vtstateparks.com. Food: Lookout Bar & Grill, Killington: This après-ski favorite is also a sweet summer spot. Info, 422-5665, lookoutvt.com. Everyone can practice their best train-whistle imitations as they ramble along this former railroad bed. 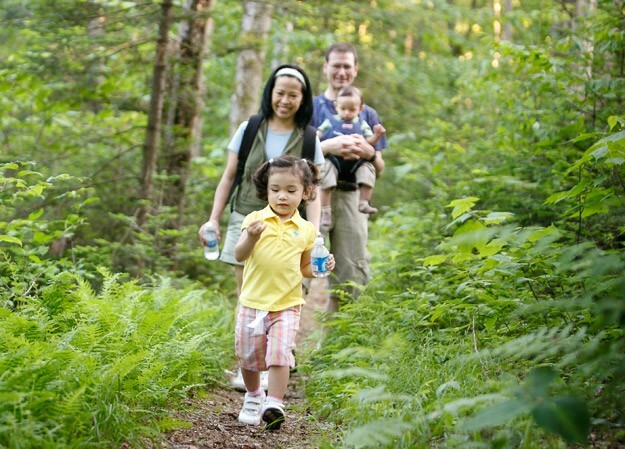 Though unpaved, it's stroller friendly, and a winner for wildlife lovers — moose, deer and beavers all roam here. You can begin at Ricker Pond State Park and meander through Groton State Forest toward Kettle Pond. One day, you should be able to walk all the way to Burlington, as this is part of the Cross Vermont Trail, a project that is stitching together an off-road route from the Connecticut River to Lake Champlain. Details: From Route 302 in Groton, go 2 miles west, take a right on Route 232 and drive 2 miles to Ricker State Park, where you'll find the trailhead. Nearby: Groton's Stillwater State Park has a swimming beach, 62 tent and trailer sites, and 17 lean-tos. Info, 584-3822, vtstateparks.com. Food: Upper Valley Grill & General Store, Groton: Egg sandwiches — go for the Snowbird — should satisfy hungry hikers pre- or postexcursion. Info, 584-3101. Is it cheating if you drive to the top? Not when you have kids who can barely reach the toilet seat, let alone the top of a 3,848-foot peak. At southern Vermont's iconic Mount Equinox, the 5.2-mile Skyline Drive wends its way to the summit of the highest peak in the Taconic Range and toward a slew of easy trails. You're not allowed to hike on the road, but once you're at the top, it's just 0.02 miles to Lookout Rock. For older kids, the Burr Burton Trail climbs 4 miles from the town of Manchester. Details: Hike up 4-mile Burr Burton Trail from Manchester, or drive up Skyline Drive — $12 for car and driver, $2 for each passenger, children under 12 are free — then take the 0.02 mile trail to Lookout Rock. Nearby: Hop in the outdoor swimming pool at Dana Thompson Memorial Park in Manchester. Info, 362-1439. Nearby: North of Manchester, Lake St. Catherine State Park in Poultney has 50 tent and trailer sites and 11 lean-tos. Info, 287-9158, vtstateparks.com. Food: Up For Breakfast, Manchester: Carbo-load on pancakes and other stick-to-your-ribs fare at this breakfast stop. Info, 362-4204. It's not the Grand Canyon, but this 165-foot gorge sure is a grand canyon — the deepest in Vermont, in fact, formed by glaciers 13,000 years ago. The half-mile hike alongside the gorge is a popular trek. On the way down, wow your wee ones with trivia: A mill here once made uniforms for the Boston Red Sox and New York Yankees. The mill workers had their own baseball diamond on what is now the state park campground. Find antiques and collectibles — and the Vermont Toy & Train Museum — in nearby Quechee Gorge Village. Details: Trailhead is behind the Quechee Gorge Visitor's Center on Route 4. Nearby: The Vermont Institute of Natural Science Nature Center, with more than 40 live avian predators, is just half a mile up the road from the gorge. Info, 359-5000, vinsweb.org. Nearby: There are 45 tent and trailer sites and seven lean-tos at Quechee State Park in Hartford. Info, 295-2990, vtstateparks.com. Food: Woodstock Farmers' Market: This year-round dining and shopping destination has just about every type of picnic fare under the sun (closed on Mondays). Info, 457-3658, woodstock farmersmarket.com. Sarah Tuff writes about health, fitness and outdoor sports from her home in Shelburne — from which she escapes as much as possible to go on adventures with her children, ages 2 and 4.